The good denizens of Unlock Democracy today unveiled their latest VoteMatch venture to aid Londoners to make up their minds which way to vote. To my relief, I should apparently vote for Brian based on his actual policies for London, and not just because he’s a Lib Dem. My second preference should go to the independent candidate Siobhan Benita. Unfortunately for them both, I’ll be voting in Oxford on 3rd May instead. Here’s my voter profile. I’m troubled by how high up the BNP are in my list — especially as I agreed with the opening statement that a multicultural London is something I value greatly about the city — but unsurprised how little I agree with Ken Livingstone. 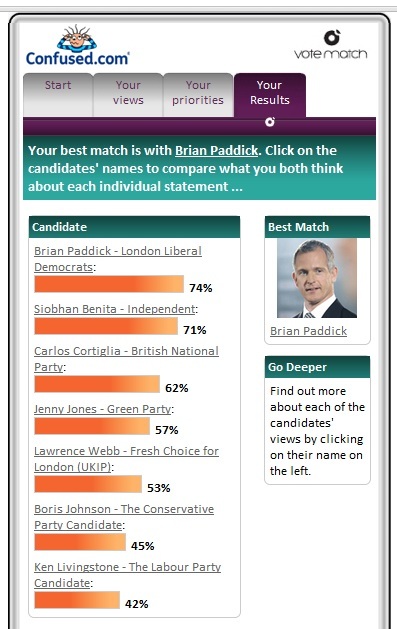 I'm 74% Brian http://t.co/OlTFejYO > which London mayoral candidate are you closest to?